Stomata are pores that numerously exist especially on the abaxial side of leaves, and play roles as the gate for gas and water exchange of the plants and thus become the interface between plants and atmospheric environment. The opening/closing of the stomata is strictly regulated in response to changes in various environmental factors, such as light and humidity. Stomatal movement originates from changes in turgor pressure of the guard cells, which is under control of the mechanics of the cell wall of guard cells. That is, when the guard cell volume increases, the stoma opens, when the guard cell volume decreases, the stoma closes. Understanding of the mechanism of the stomatal movement is not only the main focus of plant cell biology but also is regarded as a basic research toward the improvement of the atmospheric environment through the carbon-dioxide assimilation of plants. 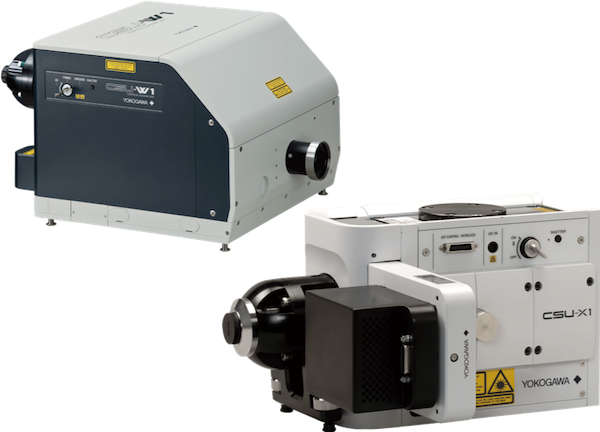 To investigate interactive dynamics of the intracellular structures and organelles in the stomatal movement through live imaging technique, a CSU system was used to capture 3-dimensional images (XYZN) and time-laps images (XYT) of guard cells. 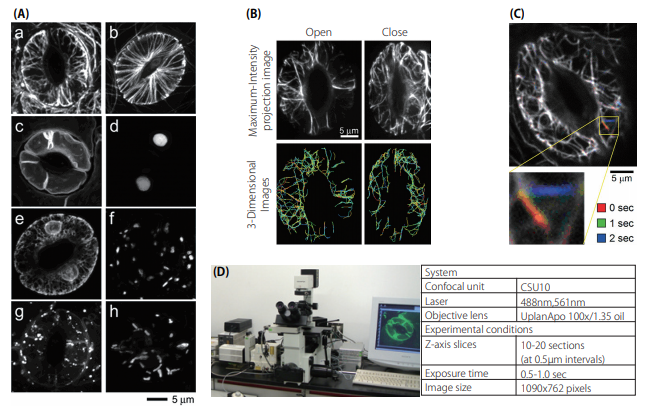 Figure : (A) Example of the comprehensive live imaging of various intercellular organelles of guard cells All images are maximum-intensity projection images which were reconstructed from serial optical sections, captured from the surface to the mid-plane. To establish standardized data to construct a comprehensive database, 50 to 500 pairs of cells were examined for each organelle. The results will be on public as (Live Images of Plant Stomata） database at http://hasezawa.ib.k.u-tokyo.ac.jp/zp/hlab.a: Actin microfilament (GFP-ABD2), b: Microtubule (GFP-tubβ), c: Vacuolar membrane (GFP-AtVAM3), d: Cell nuclei (HistoneH2B-tdTomato), e: Endoplasmic reticulum (GFP-ER), f: Golgi apparatus (ERD2-GFP) g: Endosome (ARA6-GFP), h: Mitochondria (mt-GFP) (B)Three-dimensional reconstruction of the actin microfilaments at the moment of stomatal opening/closing The orientation and bundling of actin microfilaments were found to change in response to the stomatal opening/closing. (C)Time laps observation of the dynamics of actin filaments of guard cells Actin microfilaments were found to dynamically change the orientation by approximately 60 degrees in one or two seconds. (D)CSU system.